Last week, Russian defence minister Sergei Shoigu discussed with Alyaksandr Lukashenka establishment of a Russian air force base in Belarus. A few days later, Lukashenka dismissed the claims that Russia will have a military base in Belarus. The news came as media of neighbouring countries continue to discuss the significance of Belarus-Russian military drill West-2013 (Zapad-2013) scheduled for autumn. Belarusian and Russian officials insist that theWest-2013 drill does not threaten anyone, and remind that last year NATO conducted a dozen of drills of different scales in neighbouring countries. Despite various speculations in Belarusian and Western media, little evidence exists to support that is Belarus threatening anyone military, together with Russia or on its own. At the moment Russia has two military sites in Belarus. Moscow emphasises that these are not “bases,” just “obyekty,” i.e., sites. In the northwestern town of Vileika since 1964 functions the 43rd Communications Centre of the Russian Navy where reportedly 350 naval commissioned and warrant officers serve. In the southern town of Hantsavichy since 2002 functions an early warning radar of the Russian Aerospace Defence Forces. At this site around 2,000 Russian troops are stationed. The presence of Russian troops in Belarus remains lower than in many other countries of the former Soviet Union, say, in Ukraine, Georgia or Armenia. Despite loud rhetoric about integration with Russia, Lukashenka so far limited Russian military access to Belarusian territory. Both above mentioned military sites were established by a treaty signed between two states in January 1995 - long before he established his authoritarian rule. Moreover, the military exercises are also not an invention of his, NATO experts knew, the regular military exercises “Zapad” were held in this region by the Soviet Union since 1973. The only breakthrough Russians had in military integration with Belarus under Lukashenka was delayed by Belarusian leader for many years creation of Single Regional System of Air Defence, which actually Moscow needed more than Minsk. Against this backdrop, the possible Russian air force base indeed seems like something very new. But the whole talk about it could be more a bargaining chip than a finalised deal. The most important resource of Belarus is its location between Russia and the EU, so contemplating a prospect of establishing more Russia troops in the country the Belarusian leader may collect points in several games, beyond getting more Russian loans or subsidies. First, avoiding too much Russian military presence is a gesture toward the EU which is not only critical but also dismissive about Lukashenka. Now, he wants to show Brussels how dangerous can be for the Europeans not to take Lukashenka seriously. Second, both Moscow and Minsk now perceive military balance in the region as worsening for them. The NATO fighter planes are present on duty in Lithuania, Poland since 2006 deployed F-16 fighter jets and since 2010 – Patriot surface-to-air missile systems. Moreover, some other details undermine the theory of a possible Russian expansion. The military exercise West-2013 will be smaller in troops numbers, although Belarus is planning to deploy its territorial defence units, yet their military significance is minimal. Polish criticism of deployment of additional S-300s in Belarus sound rather insincere as Warsaw since 2010 deploys Patriot missiles, an American equivalent of S-300, which according to some analysts Patriot actually may be even superior to its Russian counterpart. Moreover, Belarus wants to get four S-300 batteries, because it has four batteries of S-200 designed in the 1960s as well as some even older S-125 systems which need to be replaced. Making too much noise about additional S-300 in Belarus makes little sense, as Minsk clearly does not exceeds the reasonable needs of its national security. Unfortunately, the latest military news from Minsk were accompanied by very unhelpful comments in the neighbouring countries which implied that Belarusian government together with Russia is a source of instability in the region. Polska daily The Times even speculated that in the autumn military drill Belarus and Russia might even practise preparing for a nuclear strike at Warsaw, referring as argumentation to some aspects of previous West military exercises. The Belarusian obsession was not limited to Poland. This week, the head of the Latvian counterintelligence agency Jānis Kažociņš said, “The military exercises West-2013 are an attempt to cut off the Baltic countries from the EU and NATO help.” He continued to warn of Russian plans to block Baltic Sea with the help of nuclear weapons. Exactly such rhetoric is very useful for the Belarusian leadership which wants to prove that Belarus is threatened and nothing has changed since times when, say, Poland until 1939 suppressed Western Belarusian population and talked of retaking the Eastern Belarus. Official propaganda in Belarus would be grateful for a chance to discuss troops and missiles with Warsaw, Riga or Vilnius instead of human rights or elections. These rhetoric from the West also stimulates the Russian leadership to continue supporting the Belarusian regime which in their eyes confronts the West. 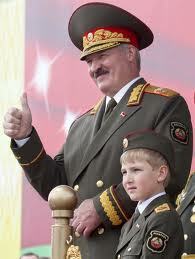 The image of an anti-Western dictator remains Lukashenka's main selling point for the Russians. The Belarusian opposition failed to neutralise these odd speculations, yet mostly chose to support them. On the 1 May festivities a group of oppositional activists in Brest came out with a slogan “Today Russian Base = Tomorrow 22 June,” meaning the day of the beginning of the 1941 German invasion. It is hard to find more unsuitable slogan for the Belarusian society deeply traumatised by the World War II. To become more real and less emotional, it is important to understand that stability and security in the region requires respecting security of all states, including Belarusian ones. So far, the Belarusian collaboration with Russia remains limited and reactive rather than proactive. Moreover, since mid-2000s Belarus is increasing its cooperation with the NATO. According to the expert of Belarusian Institute for Strategic Studies Dzyanis Melyantsou the cooperation is a long-term and relatively successful which continues without much publicity. In this context, the rhetoric of military threats should be used by those who like to speculate on it, including Alexander Lukashenka with his pathetic speeches of “the trenches of the Great Patriotic War.” Fortunately enough, this time top officials of the neighbouring countries resist a temptation to lash out at the Belarusian regime for its military policies. Probably for a good reason.